1. Accept the Urban Sketchers Mission and Manifesto. 2. Participate regularly in Urban Sketchers Portland sketch outings. 3. Be willing to post your sketches (done on location) regularly to the blog. 4. Contact pdxusk@gmail.com for information on joining the blog! Sketchy friends...a heads up that Aaron Bros is now having all sketchbooks at 40% off. They carry Stillman & Birn and Strathmore Visual Journals. Both have heavy weight paper that is made for watercolor. I just stocked up. 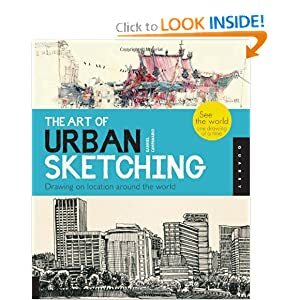 Sketchy friends, I'm looking to surprise my wife with an urban sketching class this weekend (December 12th or 13th, 2015). We're celebrating our "paper" anniversary so I want to do something where we learn a useful creative skill (basic sketching!) and get something to take home with us too. Could I pay one of you fine sketchers to give us a 2-3 hour lesson? I know she would love it and I would love it too!! If you can't do it but have a friend or someone that might be able to, please do respond to this! !